Finding a knee brace that can stand up to the demands of an active knee that has previous ACL injuries can be somewhat difficult. There are countless of knee braces out there, but not all of them offer support that’s specific to ACL recovery requirements. While the market might seem flooded with medical devices to help support your knees and prevent injuries, only the best ones will offer top notch injury prevention as well as assist you during a recovery period of an ACL injury. 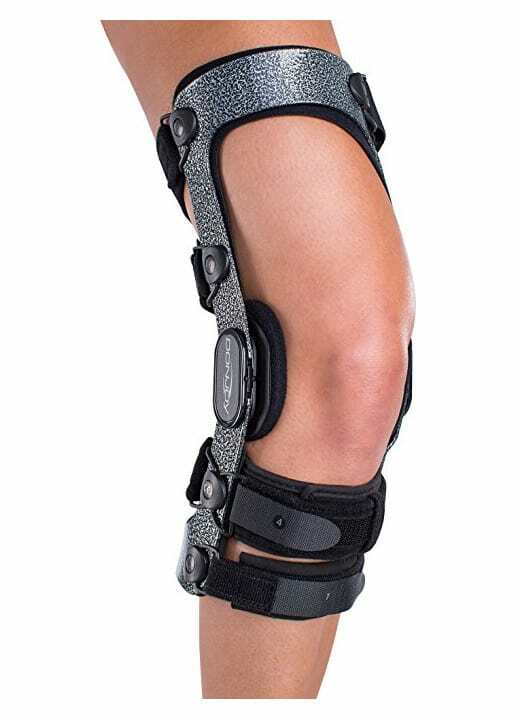 We love this knee brace because it comprises of groundbreaking DonJoy Fourcepoint Hinge Technology. Now before you think it’s just a marketing gimmick, its design actually enables this spring-loaded brace to apply constant tension to the hamstring. What this does is pull the tibia back, effectively reducing your risk of an ACL injury. The brace works whenever you extend your leg, and will produce resistance when you move to the point where you might expose your knee to too much movement. The really nice thing about the DonJoy Armor is the fact that you can choose how much resistance you want applied to the knee, since it comes with three adjustment settings to ensure perfect fit and ultimate wearing comfort. Who Benefits From This Knee Brace​? Offers 4 points of leverage. May help prevent the risk of hyperextension. Has a smooth stop on extensions. Has a swooping frame that offers a custom fit. It might not be an ideal fit for athletes that don’t have ACL injuries or are trying to prevent them. It’s not the cheapest option on the market. Like you saw in the great features, the DonJoy Armor comes available in 7 different sizes, and it can be worn by men and women alike. Some folks have an issue with the sizing, but if you're careful with taking the measurements, particularly above the knee, chances are you won't have a problem with the fit. The DonJoy Armor Knee Brace offers great support and wearing comfort, and we reckon that it’s a pretty amazing fit for athletes that need a little support for their professional career development. We loved the fact that this brace was super strong compared to its lightweight design. You still get enough free movement in order to partake in your sporting activities, yet you can feel the amazing support you’re getting while you’re moving with the brace on. The simple answer is yes. If you’re an athlete that participates in a sport that exposes your knee to high impacts, you’re probably looking for something to help prevent a dreaded ACL injury. Seeing to the fact that the DonJoy Armor Knee Brace with Hinge comes available without a prescription, it’s really easy to find too. However, for those that just want a little bit of added support, this could be an unnecessarily robust brace, otherwise it's great for those who have experienced ACL injuries and want some injury-specific support.